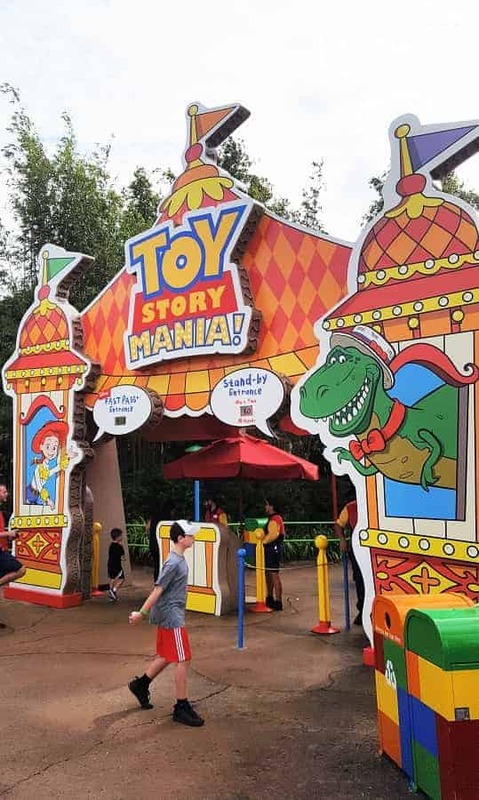 Toy Story Land is Disney’s newest attraction space in Hollywood Studios park in Walt Disney World! It makes you feel like you are walking through Andy’s backyard like one of Andy’s toys! 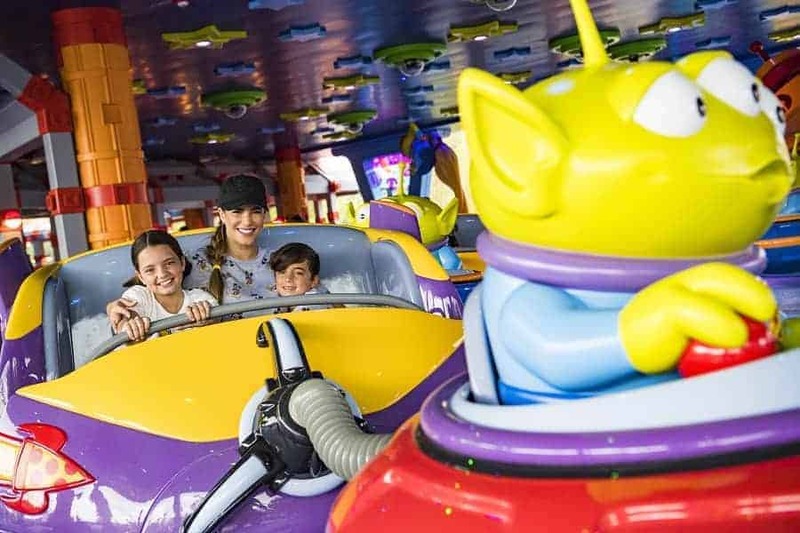 You will walk among giant building blocks, your favorite childhood board games, and iconic toys in the playground of your dreams. Wondering what you can expect? 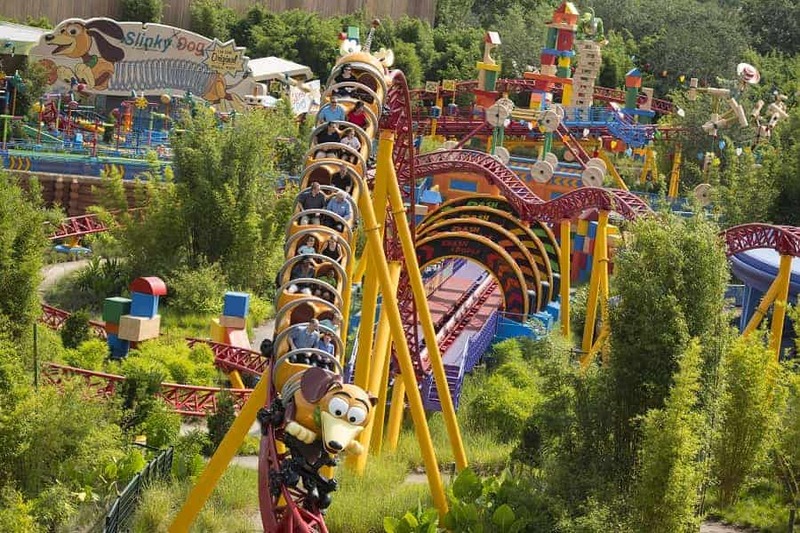 This family-friendly roller coaster takes you on a rip roaring ride on Slinky Dog! Talk about fun! This ride is just the right mix of unexpected turns and rip, roaring fun! Get to the Hollywood Studios park 1 hour before it opens. They will let you through the actual gates 30 minutes before park opening and you will be able to line up in a holding area. Go to the left. 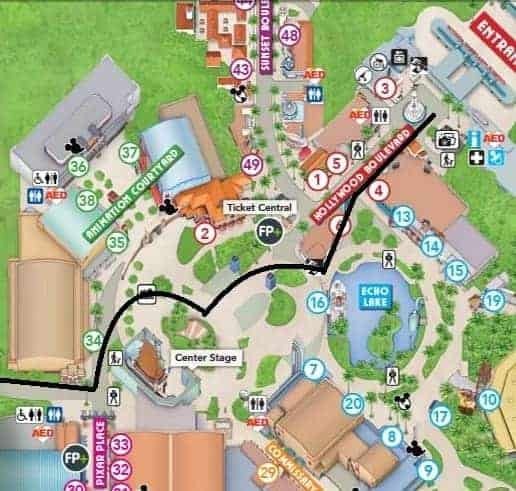 While most people will head right down the center of Hollywood Boulevard to line up, you should go to the left, like you are going to Echo Lake. The line is shorter and you will have a better chance at getting in the front. This is a holding area. 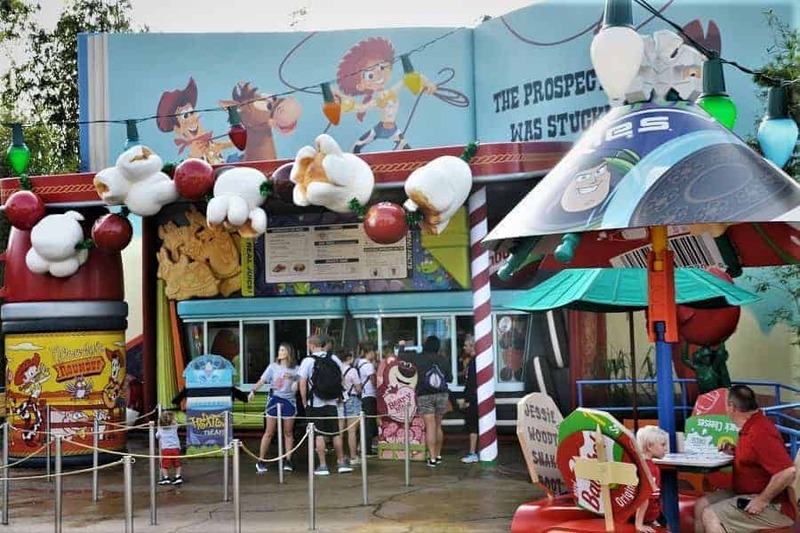 The Cast Members will walk you to where the other line starts and both areas will be released at the same time about 15 minutes prior to the park actually opening. You will then walk in an orderly fashion in front of Center Stage, down the steps toward Pixar Place, veering off to the right to line up under the umbrellas. We followed the umbrellas and were able to walk straight on the ride with a wait of only 2 minutes! You will find that if you queue up for Alien Swirling Saucers right after you get off, you will hardly have any line. We didn’t wait at all! Go inside a play set that Andy won at Pizza Planet! Your favorite little Aliens have powered up their flying saucers and will send you spinning! It is a slow ride. Nothing like the spinning you do on the Tea Cups in Magic Kingdom, but once you get going, there are some fun twists to be had on the Swirling Saucers. Game 1: Hamm & Eggs. Knock down barnyard animal targets using hard-boiled eggs. Game 2: Rex & Trixie’s Dino Darts. Launch darts to pop balloons in this game starring Rex and Trixie. Game 3: Green Army Men Shoot Camp. Baseball toss game that give you the chance to break plates. Game 4: Buzz Lightyear’s Flying Tossers. It’s your favorite ring toss game but this time you will be tossing them on Aliens! Game 5: Woody’s Rootin’ Tootin’ Shootin’ Gallery. Shoot suction-cup-tipped darts at a variety of mine-cart targets. You will be on a race to the finish with this one! 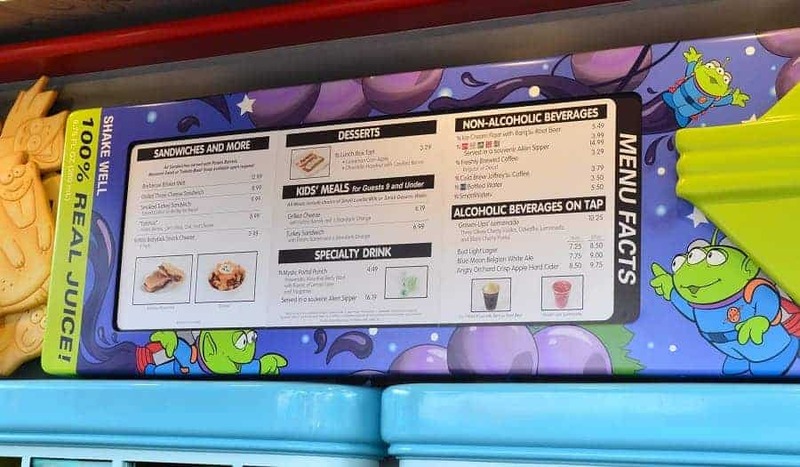 This quick service counter features classic American food, ice cream floats and other Toy Story-themed goodies. We found the breakfast menu to be quite limited (breakfast bowl, parfait and grilled smores sandwich). For lunch & dinner, they have a few soups, sandwiches (pbj, brisket & turkey), and macaroni salad. I was a little disappointed that there wasn’t more choices. 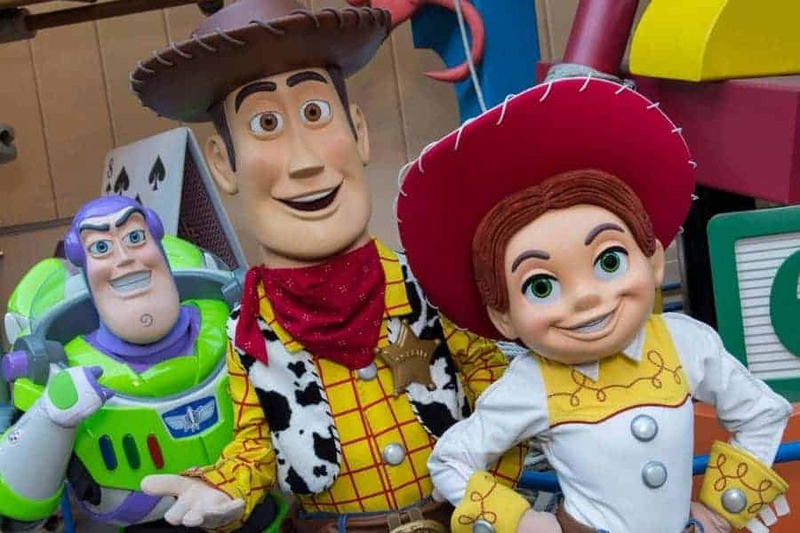 You can meet Sheriff Woody, Buzz Lightyear, and Jessie the Cowgirl. 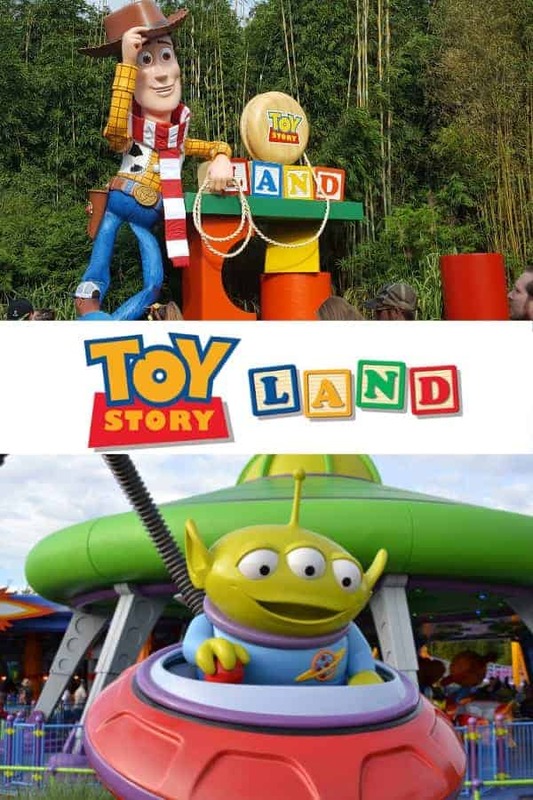 Are you excited for the addition of Toy Story Land?